The Lagos State Police Command has arrested the woman who locked her maid inside an apartment in Mafoluku area of Lagos. Recall that the Commissioner of Police, Lagos State Police Command personally went for the 11- year-old maid , Precious Nwafor’s rescue Thursday . Her rescue followed complaint of ill treatment by neighbours. The suspect, Nkechiyere Nwajagun, a banker , admitted to have locked Precious inside the apartment but was quick to add that it was only between the time she went to work and returned. She explained that her elder sister brought Precious from the village but travelled for the Christmas vacation, leaving the maid in her care. Spokesman for the Lagos State Police Command, Chile Oti , who confirmed the arrest , said : ” The female banker who hails from Ajali in Orumba Local Government Area of Anambra state but resides at 12 Baderin street, Mafoluku Oshodi, reported at Makinde Police Station Oshodi , last night ( Thursday night) from where she was taken to the Human Rights Section of Lagos State Command Ikeja. 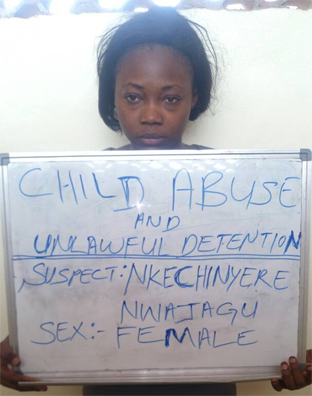 The post Police arrest female banker who locked maid inside Lagos apartment appeared first on Vanguard News.